I ate nothing but a salad on the day of this meal. A few days after our Bucket List Date Night at Beauty & Essex it was time for round two. 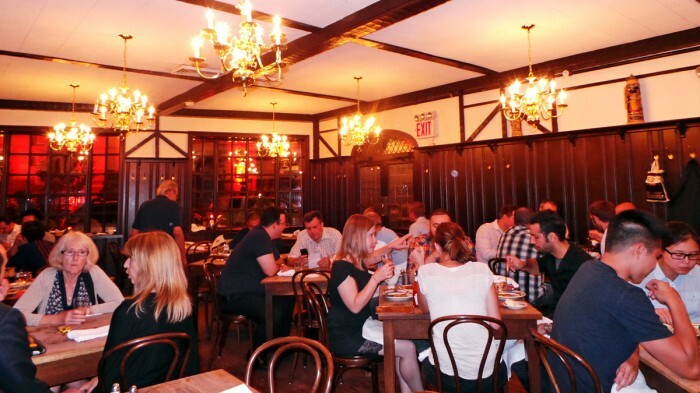 This time, the destination was the much more dude-ly Peter Luger’s Steakhouse. I know you’re not gonna believe it, but somehow I had never gotten around to eating there before. 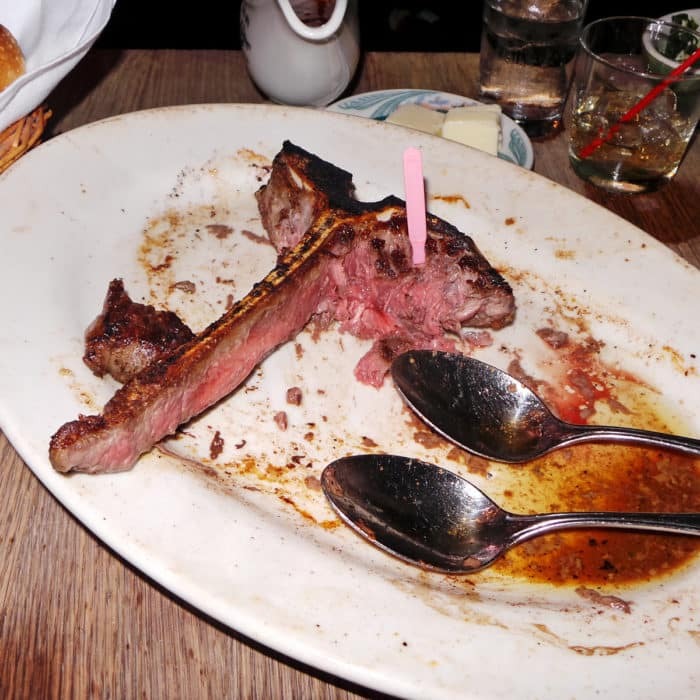 In fact, I consider myself pretty inexperienced with steakhouses at all. I don’t even order steak very often when I’m out. I don’t really have a good reason for any of this except that going out for steak is prohibitively expensive so I don’t splurge on it much. 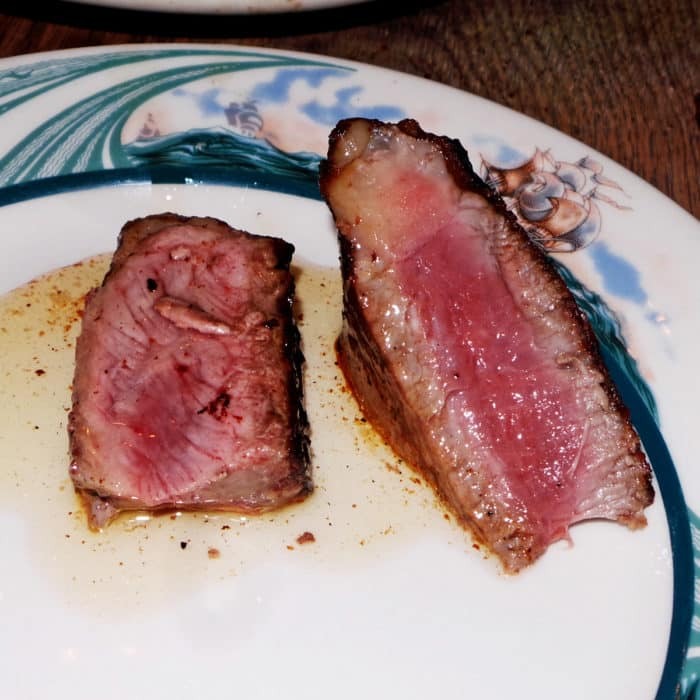 A meal at Peter Luger’s is just about as far opposite an experience as you can get from Beauty & Essex. There’s nothing pretty, fancy, or even trendy about the place. It’s very old-school with stodgy old Eastern European men wearing bow ties and short-sleeved white button-downs. They are there to serve you incredible, massive portions of dry-aged meat and nothing more. It’s gruff, no-frills service, but that part of the charm. It’s a pretty upscale joint, though when I asked if they had a dress code they told me it’s casual. 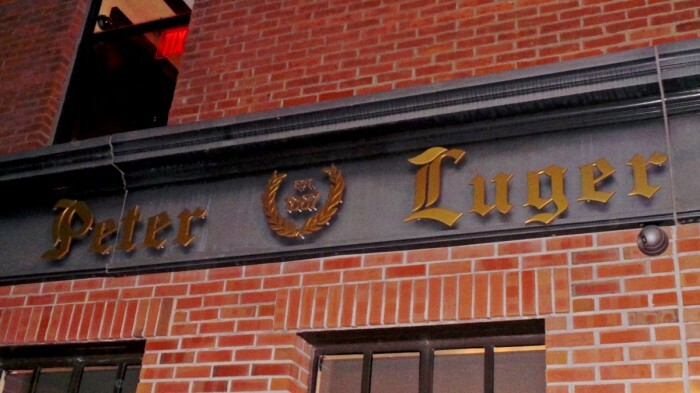 You can get away with wearing a t-shirt and sneakers or slacks and a blazer at Luger’s. It’s also located in a relatively difficult-to-access and rather sketchy part of South Williamsburg so you may not want to overdo it with looking fancy on those streets, especially if you’re getting there by subway. It’s not an area I like walking around at night, especially with a pocketful of bills for the pricey, cash-only steakhouse. Even though Amy called for a reservation over three weeks in advance, the place was already very booked up. The only time available for two on that weeknight was 9:45 PM, much later than our usual dinner time. So be it, we were going to go out in style before we headed off to the West Coast even if it was later than we’d regularly choose. I sort of knew exactly what we were going to get, so as soon as we sat down we placed our order and waited for our food to arrive. We started with a single piece of $5 Luger’s Sizzling Bacon between us. One piece of bacon, you ask? Yes and it really does cost $5 for the piece, but it’s totally worth it. It’s thick, slab bacon that’s really more like fatty, melty ham than it is any traditional bacon. It was roasted really well and had a crispy, juicy, charred, smokey, meatiness in every bite. 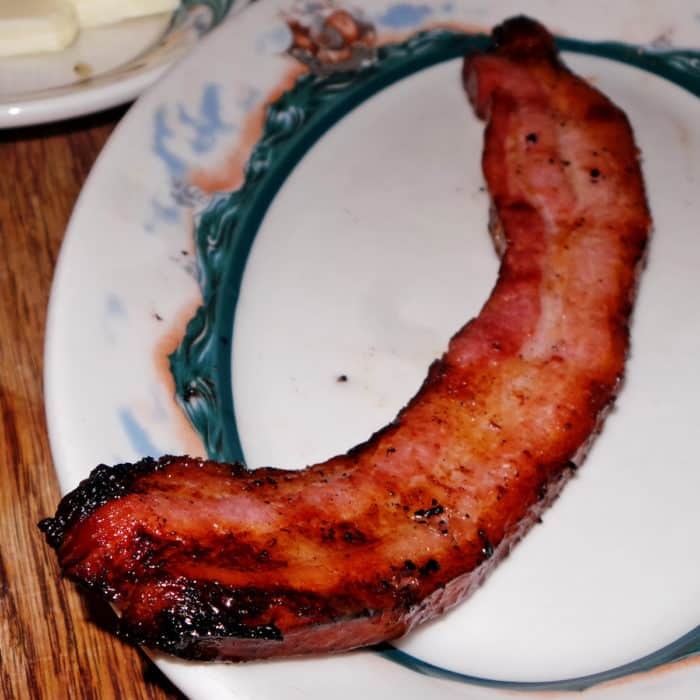 This bacon is what all other bacons strive to be. Along with our meal we figured we should have some drinks. Since Amy and I were dude-ing out, we each got a glass of whiskey rocks to wash down the flurry of meat. And what a hefty pour it was. 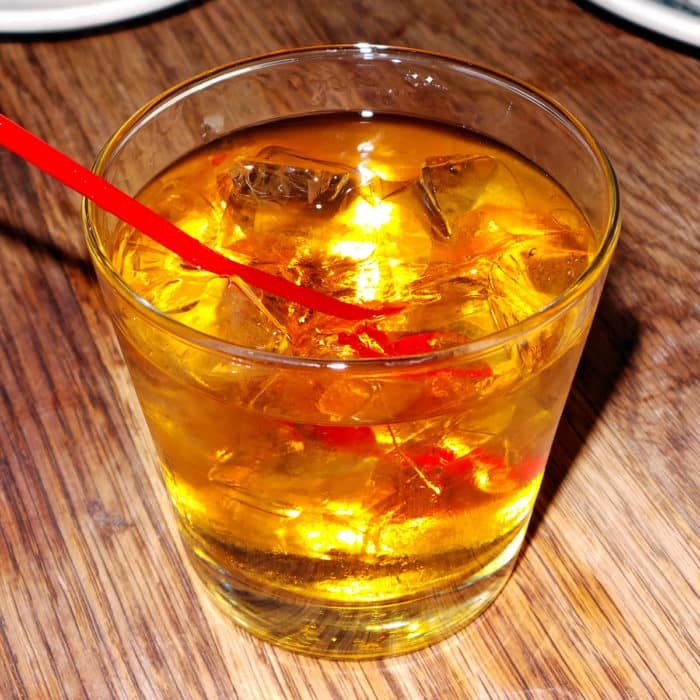 Whiskey, cubes, perfection. 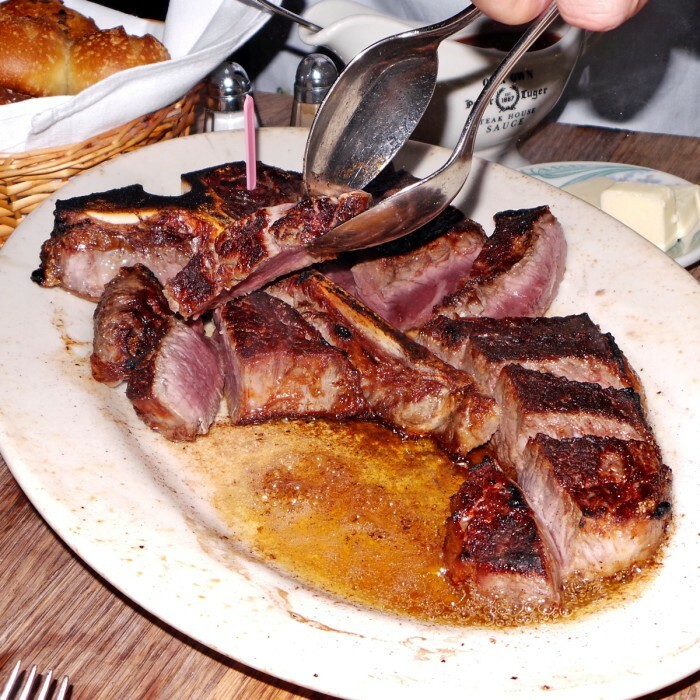 Then it was time for the main course, the real reason you go to Luger’s, the steak. We ordered the Steak for Two, which at $99 was certainly one of the splurgier single dishes we’ve ever treated ourselves to. 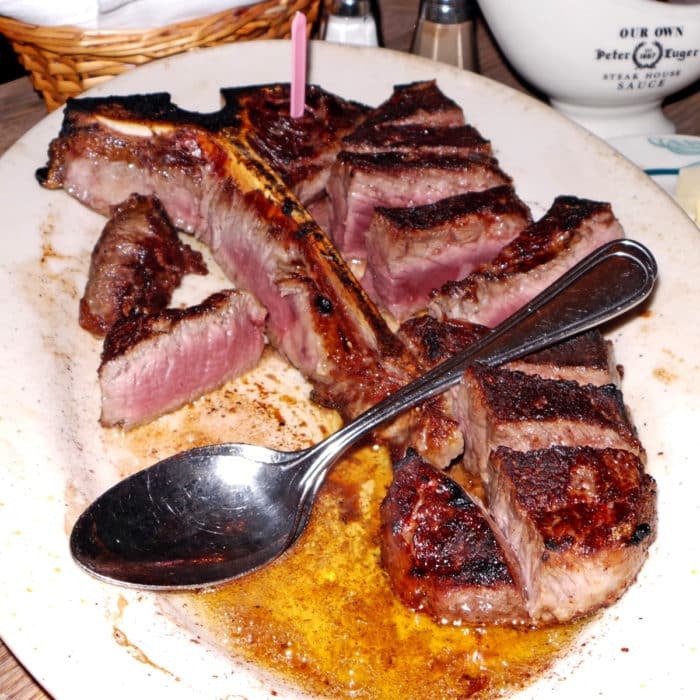 They brought out the massive, pre-sliced, sizzling Porterhouse t-bone steak on a bubbling butter-filled plate and sat it down on an overturned saucer to allow all of the liquids to slope to the bottom of the platter. As soon as it hit the table, the waiter transferred a couple pieces of that gorgeously pink-on-the-inside charred-on-the-outside medium-rare dry-aged steak to our plates followed by a sizzling spoonful of that hot, buttery grease. I know most people don’t finish their steak and end up getting their leftovers tossed in a doggy-bag to take home, but Amy and I went to town and polished the whole thing in no time flat. It was absolutely the best steak I’ve ever had, though I’ll admit I’ve gotten just as excited about many other vastly cheaper meat dishes elsewhere. But if you’re a steak lover though, you’ve gotta have it. 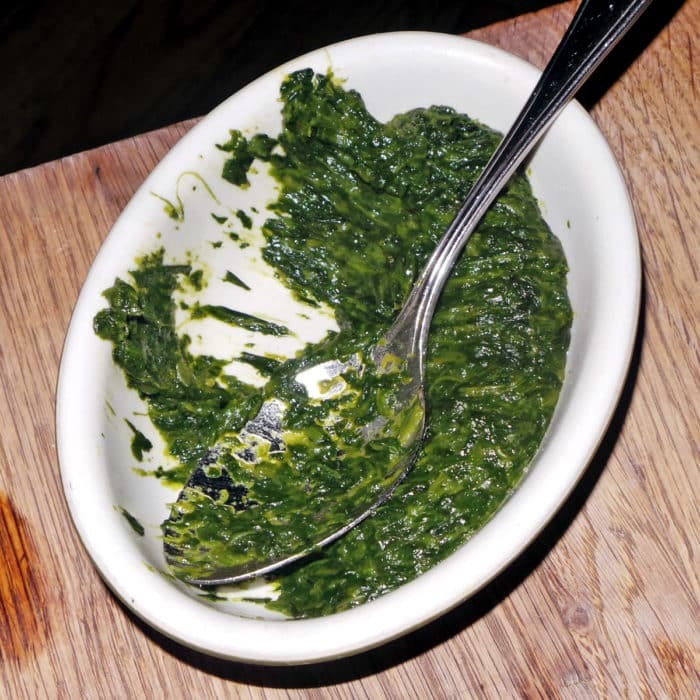 Along with our steak, we did get one other thing: Creamed Spinach. I know it doesn’t exactly sound like the strongest order at Peter Luger’s, but it came highly recommended from a number of trusted sources. 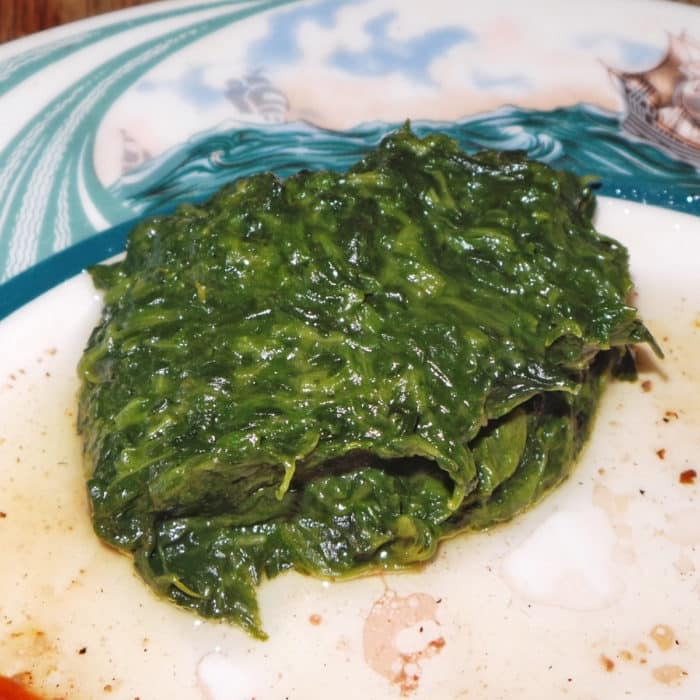 This was in fact a very nice rendition of the simple steakhouse staple, relying very little on cheese or cream for richness, but instead allowing the vegetal flavor of the spinach to shine through. It had a light, fluffy, airy, whipped consistency and with the addition of a touch of salt and pepper, made for quite a nice accompaniment. You probably think we were done at that point because we had polished every single thing that had already been presented to us, but you’d be wrong. It’s not often Amy and I go for dessert, but after reading a top seven list from one of my most trusted food writers, I knew we had to get a slice of the raved about cheesecake. This one was spectacular and it’s no surprise because Robert Sietsema and I almost always love the same things. This hulking wedge of cake came served with a mountain of handmade whipped cream which was about a million times better than the from-a-can BS you’re probably used to. When swiped on top of this lusciously thick and creamy, funky, cheesy cake it was incredibly good. 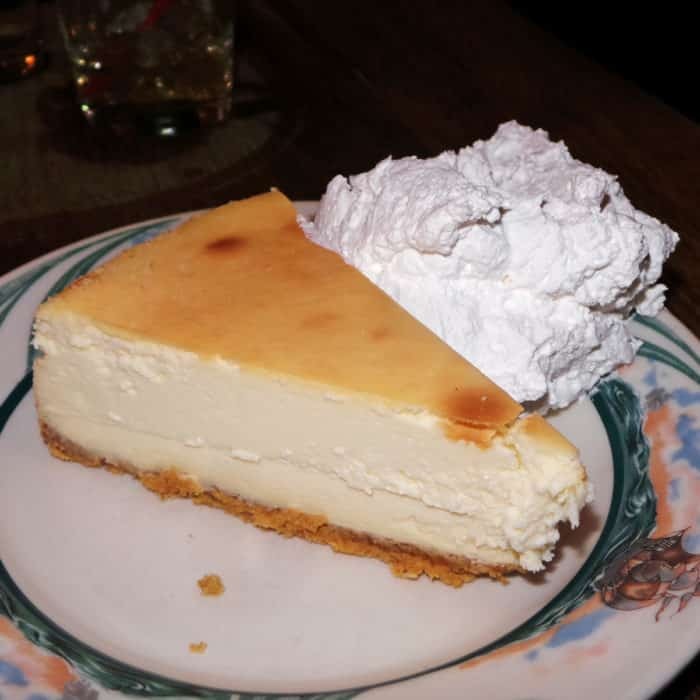 Between the flavor and texture of the cake, the crumbly cookie crust, and the fresh whipped cream topping, everything about this cheesecake was perfect in my opinion. Definitely save room for dessert, even if you’re already full like we were. Go for it anyway. It’s worth it. Well, we crushed every single dish presented to us, so I think it’s pretty safe to say we enjoyed ourselves. This place is probably better suited for a guys’ night out or business dinner than a date night, though it served as a fantastic date night-slash-send off dinner for us. Spend the money, get the bacon, get the steak, get the cheesecake, and be happy you did. 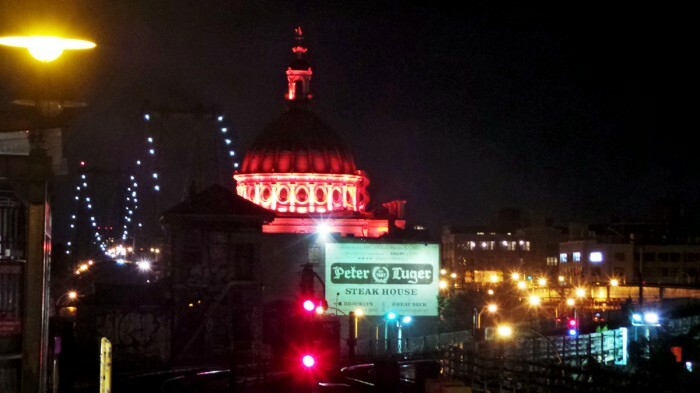 Got another epic sanctuary of meat in NYC I need to check out next time I’m back in town? Let me know in the comments below.